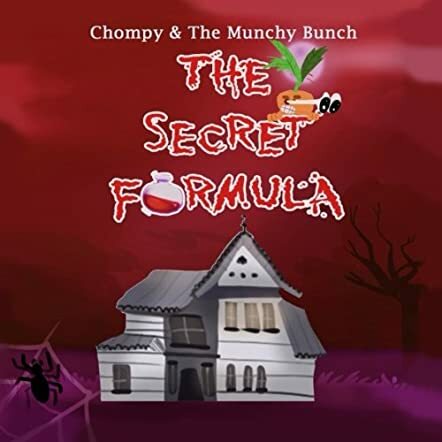 The Secret Formula: Chompy & The Munchy Bunch by Nancy Beaule is a cute children's book with spooky undertones. Chompy the Carrot and his friend Salty read about a secret formula that gives them super-eye powers. Chompy must have that formula, so he asks Salty to help him get it. The paper says the formula is somewhere in Dr. Peppa's house. Only, it has been rumored that Dr. Peppa's house is haunted! Salty and Chompy must get up the nerve to go into Dr. Peppa's big, spooky house to look for the secret formula that will give Chompy super-vision. As they plan their mission, they decide to take along Candybar, a known prankster, so that they can keep an eye him. Together, with Candybar's little sister, they all start for Dr. Peppa's creepy mansion. Will they find the formula? When they begin searching the house, strange things start happening. If Candybar is with them, then who is giving them warnings to leave? The Secret Formula: Chompy & The Munchy Bunch by Nancy Beaule is a fun children's book featuring food characters and a cute little plot. I enjoyed reading this book. I loved the illustrations! The illustrations are colorful and engaging. The story was not at all scary, a perfect kids' adventure book for younger, more sensitive children. Although the story was cute, I found it to be a little confusing, in that the characters tend to eat things related to themselves. Chompy is a carrot, and he is in search of a secret formula made from carrots. I wasn't sure what a child would think about that. I liked that the story's adventure was mild, so as not to scare younger readers. The bully was not really mean, and any danger was dealt with quickly. Although as a parent, I found certain elements of the story to be questionable, the illustrations were fun. I would suggest this little adventure book for children ages 4-6.